The government announced "on screen" times table testing for all year 6 (11 year old) children this week. This is part of Nicky Morgan's "non-negotiables" that aim to ensure all children have a floor standard in terms of competencies. 1. 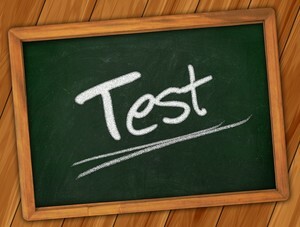 Testing is a fact of education, a fact of life. Once it is routine it becomes easier and is therefore a positive benefit for pupils. We wouldn't agree with testing for the sake of it or where (beyond reasonableness) testing becomes the goal, rather than learning. 2. Schools have a responsibility to ensure a good education for all pupils. Responsibility without oversight leads to abuses in the system - this is one potential solution to ensuring delivery of non-negotiables. So overall we believe this a generally positive move, although we might quibble with the desire (and rationale) to learn the 11x and 12x times tables. We would also question why number bonds aren't included in this as well, as irregular bonds to 20 are very commonly used with manual calculation. 1. Method: we would assume a system that incorporates randomised web-based testing will be employed. 2. Authentication: it will be interesting to see how children are "logged-on" to the system. Perhaps a master password for the school and then individual UPN. 3. Test Format: critically how many questions and how long. We would suggest 100 questions would be a good sample, with a time limit applied - maybe 15 minutes. This is based upon knowing that an extremely fast player completes 20 questions in 30s (1.5s per Q or 40Qs per min) - a competent year 5/6 pupil in <60s (3s per Q or 20 Qs per min). And if you're testing recall then you don't really want to allow pupils to go beyond 10s per Q. That would be a fair sample size, but probably too intensive for 15 minutes. So maybe banks for 20 questions, with a break between each bank. The last point is quite critical - you do need enough questions to be able to fairly test the knowledge of an individual. Not enough and the randommised nature of the test will produce odd results. This would even out over a whole school which is possibly more what the government is interested in. However if they aren't careful then it may simply test the times table knowledge of the country, but say very little about individuals or schools. It goes without saying that practising times tables will lead to better recall and out expectation is that schools currently using Number.fy will be at a significant advantage when it comes to performing on the tests.